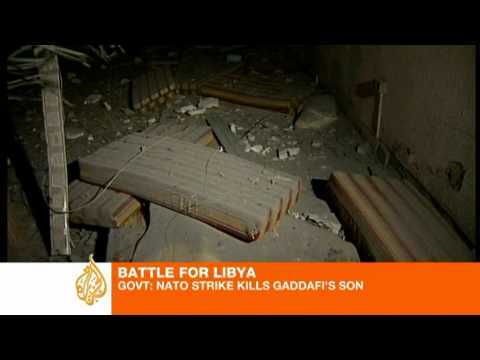 I’m going to play skeptic on the Libyan government account of the NATO airstrike. The cover story is that Muammar Qaddafi and one of his wives was visiting son Saif al-Arab and the grandchildren and suddenly a dastardly NATO airstrike killed the son and three grandchildren but left Muammar and the wife unharmed. ‘ All NATO’s targets are military in nature and have been clearly linked to the Qadhafi regime’s systematic attacks on the Libyan population and populated areas. We do not target individuals. The strike was part of NATO’s coherent strategy to disrupt and destroy the command and control of those forces which have been attacking civilians. Imagine that someone using a satellite phone repeatedly called from that compound to the tank commanders besieging Misrata, complaining that not enough progress had been made in destroying the port and wiping out the Free Libya forces. NATO signals intelligence could have intercepted such calls, and triangulated to find out where they were coming from. If Saif al-Arab had been given command duties (as many of the sons had), or if his father or a general had given orders from that compound, then the site would have attracted this sort of retribution. A strike on a site from which commands came to kill non-combatants or interfere with their food supplies would be well within the UNSC charge. There is another wrinkle. Reporters who visited the bombed compound said they could not imagine that anyone who was there survived. We have no proof that Muammar Qadddafi was at the site, except his say-so. I would be cautious about believing without confirmation the allegation of grandchildren killed; if true it would of course be highly regrettable, but Qaddafi shouldn’t have allowed them near a command and control site. But this is a regime that has buried empty coffins in order to create the illusion of civilian deaths from NATO airstrikes, and it would be easy enough for them to later say, oh, sorry, it wasn’t the grandchildren. The story could just be agitprop. While all this was going on, Qaddafi had ordered Libyan naval vessels to mine Misrata harbor, and had threatened to attack any ships that brought food or medicine to the the residents of the besieged city. Before the strike, Qaddafi had gone on television and said he was as beloved to Libyans as the emperor of Japan was to the Japanese, that he would never leave Libya, and that he was ready for a cease-fire any time. But Qaddafi is manifestly not popular or else he would not have to order tanks and artillery to fire on non-combatant protesters. And, if he wanted to declare a ceasefire, nothing is stopping him. He is on the attack in Misrata and the Western Mountains region, and the fighting there would stop if he ordered his forces to withdraw. Qaddafi brigades started up their barrages against Misrata again on hearing the news from Tripoli. Scott Peterson has a rare and brave report from Zintan in the Western Mountains region, which discusses the murderous and indiscriminate GRAD attacks on the city.